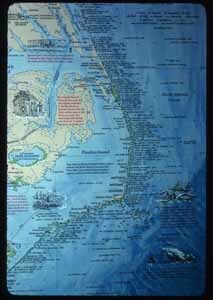 Articles from "Teaching with Historical Places"
The surfmen were the predecessors of the United States Coast Guard. This is actual Coast Guard training video. You will see a helicopter pilot practicing an escape from a shallow water crash. What is the purpose of the men in the red swim gear? 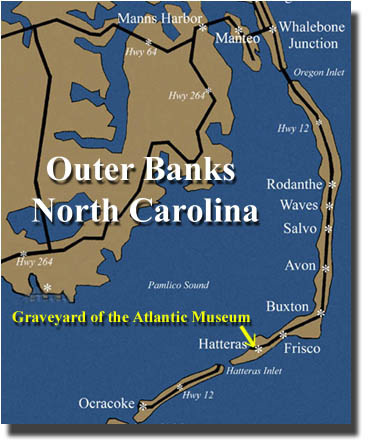 Despite the lighthouses to help keep ships on course, wrecks were still happening in alarming numbers off the Outer Banks. 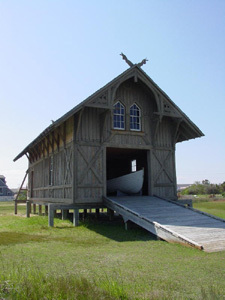 In 1874, the first seven Life-saving Stations were built along the N.C. coast, including one at Chicamacomico and one at Little Kinnakeet. That same year, a U.S. Weather Station was also established at the Cape Hatteras Lighthouse. Later, new Life-saving Stations were establsihed at Oregon Inlet, Pea Island, New Inlet, Gull Shoal, Big Kinnakeet, Cape Hatteras, Creed’s Hill and Durants (Hatteras Village). The Life-saving Stations, in addition to lighthouses, weather stations and post offices, provided jobs with steady pay, and the islanders scrambled to get them. 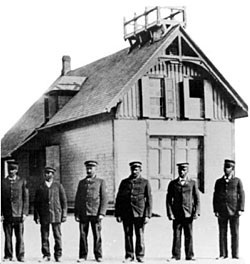 The Life-saving Stations got the island’s first telephones in 1885. How can an act of courage reveal a person's true nature? 1.What clues does the author give to explain the role of the surfman? 2. Quote from the text to explain why it might be helpful for Nathan to study medical books? 3. What is the purpose of the first paragraph? Why is it printed in a different typeface? 4. How does the motto of the surfmen convey the dangers they face? 5. Read page 271. What does "to man the ropes" and "paying out ropes" mean? 6. On page 271, the text states that the men were cheering. Draw a conclusion. Why were the men on the ship cheering? 7. What simile does the author use to describe a screaming child? (Quote directly from the text.) Why do you think that the author used this simile? 8. How does the illustration help you appreciate/understand the emotions of the scene? 9. Nathan is the narrator. How would the point of view of the story change if Mr. Meekins narrated the story? 10. What clues from the text tell the reader how Nathan learned about treating bleeding and hypothermia? Quote your answer directly from the text. 11. Mrs. Gardiner says, "He seems to know what to do, dear." How might Nathan's skills be different from those of the other surfmen. 12. How did the author let you know that Nathan doubted himself earlier? 13. What does the picture show you about what the characters are feeling? 14. What do you think would've happened to the crew if the surfmen hadn't helped them? 15. How do you know that the captain of the ship is grateful? 16. How does the beginning scene of the book contrast with the final scene?